Important note: Due to the meanwhile very long waiting list, we unfortunately can not accept any further pre-orders for the Baader APO, we apologize. We will inform you when something changes. Astro-Physics 130mm f/6.3 StarFire GTX Refractor "Gran Turismo"
At the moment, interested in this product as far greater than we could ever produced. We appreciate every inquiry, but we ask for your understanding that this product has very long delivery times (waiting list), because it has already achieved a surprising level of awareness. The reason is probably a Testbericht in the ATT-Magazine (Astronomy Technology Today) in USA. 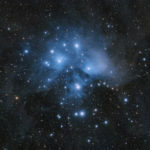 The following image of the Pleiades (M45), which our customer Christoph Kaltseis has achieved with the Baader APO Travel Companion and the 10 Micron GM1000HPS on La Palma (Athos Campus), is a special treat regarding image detail and star rendition. Partically interesting is the Nikon D810A camera with a 36x24mm sensor and 4.87my pixels. Its sensational resolution will show any aberations in the optical system straight to the edges mercilessly. Most CCD cameras either have smaller sensors or much larger pixels, which helps to camouflage optical deficiencies. Not to speak of bad seeing... Image editing / sharpening was done with the APF-R Method. Due to the good optical quality of Baader APO, airy discs with 5 micron diameter where archieved – not to mention the excellent tracking of the GM 1000 HPS mount and the brilliant location (observation site). I got the telescope with multi-purposes in mind, widefield photography and solar-observations using a Herschel-prism (in the end for narrow H-alpha imaging, but that is next step). Having tested the scope for the first time out, mounted on a Skywatcher Az-EQ5, I am extremely impressed about the sharp color-free wide-field images in a widefield eyepiece. using my old handgrenade (Nagler 20mm type-II) the 3 degree field is virtually aberration-free, and at the other end in a HR2.5mm @ 240x showed a nice gibbous Mars (very small at this time, but still crisp and clear with dark markings showing and a hint of cloud-markings, and almost no sign of chromatic aberration - except for Mars being close to the horizon). The mechanics is excellent, cooldown very rapid, and the optics show a nice, weak, greenish tint from the excellent AR-coating. I am absolutely recommending this scope for casual and serious work. The versatility of a low-weight wide-field APO. Been observing on and off for 40 yrs. and own a SkyVision 20" f3/3 GoTo dob which is a truly amazing scope, but I can't take it with me when I travel on an aircraft for instance, and there is no room for it in the car when we go on holiday. Best scope I have ever owned but not always the right scope in every place. So last year I decided to acquire the best truly Grab & Go refractor I could afford. It must be big enough to resolve planetary detail but small enough to carry on an aircraft overhead (including Tripod) with ease. No small order you may be right in thinking. The tripod and mount had to be as carefully chosen as the scope because a truly Grab & Go setup must consider the setup as a whole. I knew I needed at least 90mm of aperture and every Apo I researched was either too slow or too fast. Also, they were all too heavy and not suited to small mounts. I don’t remember how I stumbled across the Baader 95/560 Travel Companion, but I knew immediately that I had found my dream refractor! 95 mm is big enough to see real detail on Jupiter and the weight was only 3.1 kilos. In addition, it has an oiled spaced Fluorite triplet objective. I once owned a refractor with a 110mm TEC oiled spaced triplet and that lens was the most transparent lens I had ever looked through. However, It needed a hefty mount and was not what I considered Grab & Go so I sold it. Back to the Travel Companion, I badgered Johannes Baader to make one for me, I would not take no for an answer and he eventually agreed to add me to the waiting list. I then purchased the Vamo Traveler mount weighing 1.3 Kilos and a Gitzo Systematic Tripod (18 inches, 457mm when collapsed). It weighs nothing, I can easily lift it up with one finger and it can hold an Elephant. I would have even considered buying this scope if it had an air spaced FPL 53 triplet because it fitted my requirements of true portability. I waited, and a few weeks ago Johannes informed me my scope was almost ready and I got excited again. When it arrived, I opened the box right away, as you do. I held the scope for the first time and marveled at how light yet robust it felt. The finish is superb, and the focuser is SOOO smooth and without flexure whatsoever. Looking down the OTA you see a very well baffled tube. I ordered mine with the tube rings, dovetail bar and Clicklock on the focuser. I quickly mounted it on the Vamo Traveler/Gitzo which just happened to be ready in the dining room! In went the Baader 2" BBHS mirror Diagonal and a Leica 25x - 50x ASPH Zoom with Baader VIP 2x modular Barlow, I was set. The whole thing could easily be lifted in one hand, but two hands are safer I told myself. I took it outside in my back garden that afternoon and pointed it at the nearby woods. The image was razor sharp and the mount was rock steady on max zoom. The following night the sky was clear. I live in a very light polluted area in the UK and have nearly given up trying to observe from home, but this night was very clear, though cold at 0 degrees C. As luck would have it I could not attach my red dot finder to the focuser as I had the wrong screws, so it was point and hope. I took the scope out from my warm dining room and pointed it at M42, the great Orion Nebulae, as it was hard to miss. I wasn't sure what to expect but I was not expecting to see the entire nebulae, I mean all of it! Usually when I observe M42 I see the bat wings spread out and then I attempt to see more but right away I saw the entire shape of it, beautifully framed. I slowly zoomed in and out in admiration. I could clearly see 5 stars in the Trapezium and the following night when I put my Morpheus 4.5 barlowed I saw the f star. I looked at M42 for longer than I have ever looked at it in a very long time, but I was getting cold. Nearly an hour had passed, and it dawned on me that if I could see so much nebulosity in M42 perhaps M45 the Pleiades might show some. I swung the scope upwards and found the cluster. Naturally I couldn't fit it all in the field of view even when I removed the Barlow from the Leica but the nebulosity was plain to see, I could hardly believe it! Most of it was visible around Merope with direct vision and a lot more with averted vision. Again, I stared at the cluster for ages in awe and all this from 95mm. An hour and a half had passed on two objects and I was freezing as the temp was falling so I went it feeling very satisfied indeed to say the least. I have observed on two more occasions (red dot finder attached) and I could go on and on about how impressed I am, another time perhaps. The scope with rings and tripod as well as the Vamo Traveler (dismantled) all fit in my Peli 1510 carry on airline case, luckily it has wheels. At last, I think I have found my ideal Travel Companion. Don't tell the wife! Auch der „kleine“ Auszug am APO95 (Baader 2" Diamond Steel Track) machte mir zuerst Bedenken. Da ich die D810A (Vollformat) verwenden wollte, oder eine SBIG STXL 11002 mit FW8G, oder eine FLI ML16200 + CFW-2-7… Da wird die Ausleuchtung nicht genügen - oder? Aber für einen Test sollte es wohl schon reichen (schnell wurde ich eines Besseren belehrt, siehe weiter unten). Damit das mit Vollformat wirklich funktioniert erhielt ich noch einen ersten Prototypen des Baader Field Flattener dazu, der in M68 Durchmesser gefertigt wurde. Das war ideal für mich, da ich schon alles im Baader M68 System hatte. Dadurch war der Abstand auf exakt 76,2mm zu erreichen - ganz wichtig! Desweiteren erhielt ich noch dazu die brandneue M68 VariLock - ähnlich der neuen UFC S70 VariLock Klemme. Diese war nach den kontern wie ein Stück! Genial! Mit all diesen kleinen Hilfsmitteln war für mich schnell klar, ja ich möchte dieses Instrument unbedingt testen. Zum Glück fand mein Anliegen Anklang, somit konnte ich bald den Baader APO bei mir erproben. Ich habe das Safety Herschel Prisma schon lange an einem guten Apo verwenden wollen, und zum C14 EHD mir einige Morpheus Okulare gekauft. Damit werde ich starten, dachte ich mir - der erste Blick geht zur Sonne! Es war der Zeitraum um den Merkur Transit und ich sah die Sonne wunderschön, extrem feine Strukturen (auch die Granulation), das machte Spaß! Um das ganze fotografisch festzuhalten habe ich abwechselnd das 14mm, 12,5mm und 6,5mm angesetzt, auf ND 3.0 umgebaut und eine Nikon Df mit Vollformat Sensor verwendet! Bis auf das grüne Farbe die durch den Solar Continuum entsteht (daran musste ich mich gewöhnen!) machte es einfach Spaß. Bei einem passenden Moment mit gutem Seeing kamen sehr feine Bilder raus im Vollformat. Die Sonne im Photoshop eingefärbt und das war es. Visuelle Beobachtung am APO? das bleibt sehr lange in Erinnerung, da ich auch den FSQ 106 EDX mein Eigen nannte konnte ich es bewerten und vergleichen. Schärfe und Kontrastleistung der 95mm Öffnung sind sehr gut und überraschen jedes Mal aufs neue! Am Mond mit 560mm und Nikon D810A sind schon feinste Details sichtbar, Auflösung sehr gut! Mit meinen sehr guten Zenitspiegel (BBHS) und dem 14mm - 6,5mm Morpheus kann eine schöne Reise beginnen - die Objekte der Messier Liste im Sommer … M13 mit dem 6,5mm war mein Favorit und einmal eine Stern Bedeckung durch den Mond in der Dämmerung, wo die nicht beleuchtete Seite des Mondes noch in der Dämmerung verborgen (unsichtbar) war - so extrem feine Sterne machen viel Freude! Der Mond gegenüber dem Himmelshintergrund (ohne Dunst, Schleier) zeigt einen Kontrast der einfach am Besten damit zu beschreiben ist: Schwarz wie die Nacht! Ich denke es ist richtig ein Bild sagt mehr als 1000 Worte… M42, IC 434, ICC 447, NGC7000 + IC5070, NGC6960, M101, M45, M13, IC59-IC63 mit APO95 (nur zwei davon habe ich hier angehängt, weitere Bilder kann ich auf Nachfrage gerne ergänzen). Ob nun Visuelle Beobachtungen, HighRes Planeten Bilder, oder Mond (bei mir der Sonnefleck mit der 236M!) bis hin zur Vollformat DSLR sucht er seines Gleichen - CAF2 und eine Ölfügung ist der Weißheit letzter Schluß - wenn es richtig gemacht wird. Durch die kleine Abmessung ist er auch Top für Astronomie Reisen geeignet wie von mir nächstes Jahr geplant. Ich will den APO nicht mehr zurück senden - aber dafür ist ja Weihnachten! The first time Mr. Johannes Baader showed my the APO 95 I was totally surprised. The APO was smaller and lighter as I thought and beautiful crafted. The small Diamond Steel Track was my next point, that made my a bit calm. I planed to use a Nikon D810A (full format DSLR) ab SBIG STXL 11002 + FW8G or a FLI ML16200 + CFW 2-7 filter wheel. Was the diameter big enough that I can use my cameras with the full field and after the flat correction will that works, too? But for a test I can live with this. That my test really works I got also the prototype of the Baader M68 Field flatterer. This was perfect because I already used the M68 system for all other adaptions for my telescopes. For the ideal distance between the M68 Field Flattener and the camera Mr. Johannes Baader had another useful and perfect part, the M68 Varilock. That made it possible that I got the perfect distance and so it was possible that I can make the first test with this beautiful telescope. Messier objects starts M13 with the 6,5mm morpheus eyepiece was my favorite ! But earlier this evening the moon coverd a star, not with the bright side, only with the grey side… and it was not visible with the naked eye but with the APO95 and his beautiful smallest stars it was a moment to remember. The first night for my deep sky images was ready. I took my Nikon D810A and if the APO handle this with 4,8mü small pixels over 43mm of the full field of the Nikon it is a bench mark. I start normally with sky flats, the vignetting was not dramatic and it shoed my immediately that the diamond steel track can be used without any disadvantage. After focussing I fixed the screw soft and started collecting lights. A images tells more the thousand words,… M42, IC 434, ICC 447, NGC7000 + IC5070, NGC6960, M101, M45, M13, IC59-IC63 with the APO95. Only some of this images I attached here, if you want I can show more of them. My summary; The APO 95 CaF2 is smaller then other optics with a similar aperture. Side by side the difference of the size is very good see. If now for imaging or observation this APO will surprise every night and night and night… It it perfect for Astronomy travels ( La Palma , Chile), the CaF2 and every part makes this APO to an outstanding instrument! @ChristophK Possible you make a summary in English, please?Thank you.